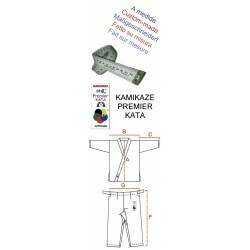 Karategi Kamikaze-PREMIER-KATA WKF Approved (100% cotton, medium weight). Kamikaze presents our latest uniform designed for all new, upcoming KATA competitors. This karategi positions itself as the best quality option to be used in kata competitions at the most attractive price. COMPETITION - WKF: Light weight karategi designed specially for KUMITE competitors. Officially approved by WKF. The special material of cotton and polyester has a very nice line drawing. K - One - WKF: Ultra-light weight karategi designed specially for KUMITE competitors. Officially approved by WKF. 142,96 €	Upon request: Takes 80 days approx. 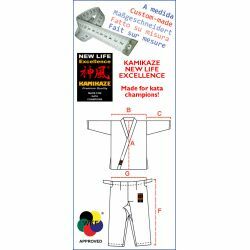 Kamikaze karategi, model NEW LIFE EXCELLENCE WKF Approved TOKYO Special Edition. 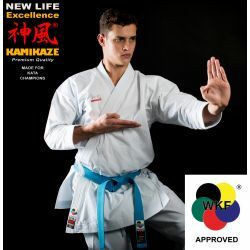 Comes with the official WKF Approved label good for all national and international tournaments plus the official Kamikaze brand logo embroideries according to WKF rules and "TOKYO Special Edition" printing on the inside of the upper back. 255,69 €	Upon request: Takes 80 days approx.